So you have a strat but you want more sustain, what to do what to do. Well there is the obvious solution of buying a better tremolo or sustain block but what if you dont care about even having a trem? The obvious solution is to just not have a tremolo at all. This is a really easy to do trick with many variations but it is something I advice anyone with a 6 point tremolo to do if they do not mind not being able to use the tremolo, but don't worry. 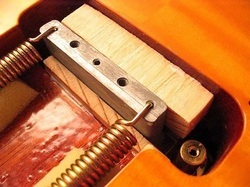 If you have tradition tremolo *Non Locking* then all you need to do is shove a piece of wood up behind the tremolo block "side opposite of the springs" and you are done, when you do this you will notice a little more beef to your tone but the biggest improvement will be your sustain. Doing this can make a strat that stop beings audible seconds after a note is played to a strat that can sustain for a long period of time. If you have a locking tremolo system such as a Floyd Rose you will need to add a piece of wood to BOTH sides of the tremolo block. You can do this for a traditional tremolo as well but its not needed for a tradition trem. For a floyd rose however you have the alternative of just having a block infront of the trem block to give you a little extra sustain but also give you a dive only tremolo.